A trumpet blares as a sequined figure bends at the waist and stomps. He swoops low enough that his fake grey beard dusts the street. Behind him, a sea of fur-trimmed hats bob to the live brass band. Pink masked faces stare back at the crowd with blank eyes. Richly embroidered costumes of orange, blue, pink, yellow and gold pass by as silver-skinned Aztec warriors prance in a cloud of feathers. It’s Carnaval de Puebla en Filadelfia. Spectators pour from row homes and restaurants as costumed paraders dance up 9th Street on their way to Dickinson Park where more revelry awaits. 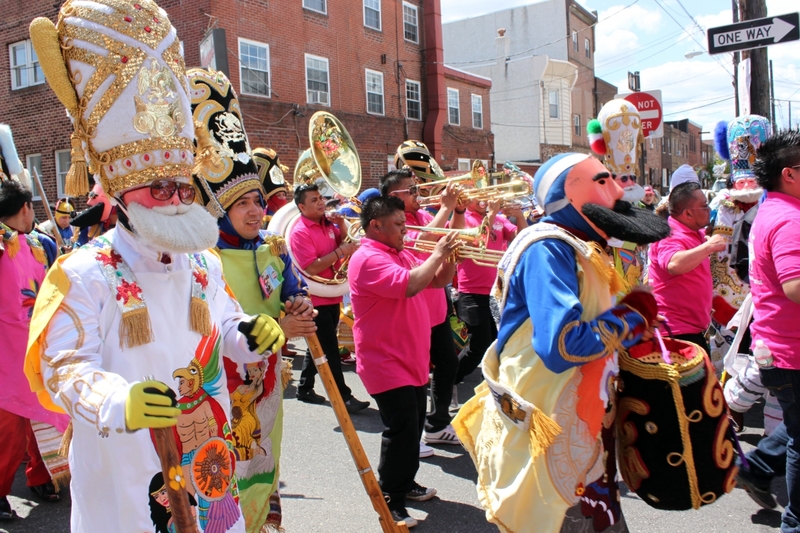 More than 70% of Mexican people who live in South Philadelphia have roots in Puebla, the site of the famous battle against the French on May 5, 1862. In Puebla, men (and since 2013 women) dress up as both French or Mexican battalion members and re-enact skirmishes from that fateful day (until the Mexican troops triumph, of course). In Philadelphia, the streets do not fill with gunpowder smoke as they do in Huejotzingo, Puebla. Here, revelers brandish a wooden musket much as they would a walking stick. In the street, we have warring factions: Zuavos, Turcos and Zapadores on the French side, and Indios Serranos and Zacapoaxtlas on the Mexican side. Zuavos wear blue caps and capes to represent a French battalion known for its cruelty. They strap a wooden box to their back decorated with the flags of France and Mexico (and in which they stash a bit of bread). Zapadores don leather helmets in Spanish colonial style to represent elite Mexicans. Turcos reference Muslims in colonial Spain (although Muslims were Moors not Turks). They dress in tall hats and silk clothing embroidered with Mexican heroes. Indios Serranos reference Huejotzingo’s indigenous heritage with hats woven from palm fronds. They also carry an animal or animal skin. I saw toy stuffed rabbits and a stuffed cacomixlte, or the ring-tailed cat that lives in Central America. Zacapoaxtlas dress as charros in embroidered suits. Green, white and red ribbons blossom from their hats.